← 4 out of 5 isn’t bad: Missing Nils Peterson! News this week: 2 events and Save the Date! A busy week ahead for the Poet Laureate. First, I’ll be attending the Montalvo Arts Center event, “Feast of the Idea,” and reading one of the poems I wrote while in residency there. 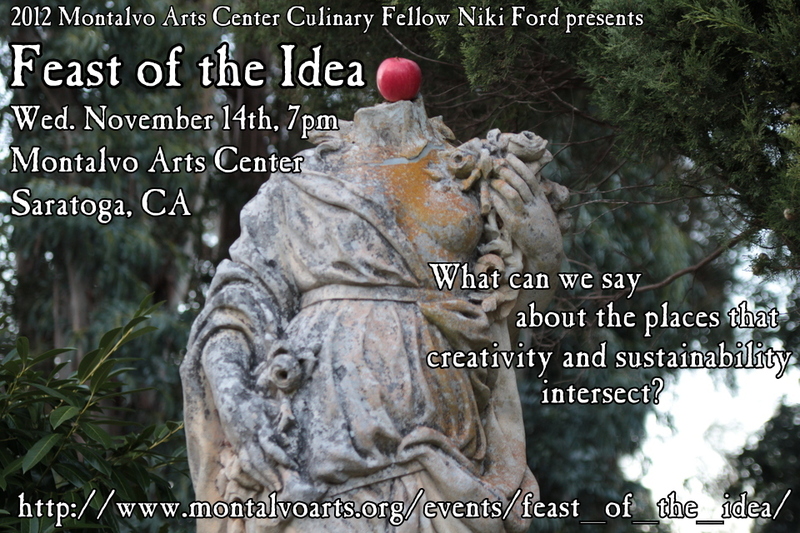 The event will be a conversation among special guests led by Montalvo Culinary Fellow Niki Ford. Anyone interested in sustainability and “how our internal and external environments relate to our sense of wellness” feel free to attend. Wednesday, November 14, 7pm, in the Carriage House Theater. The following evening, this Thursday, November 15, I’ll be the Featured Reader at Poetry Center San Jose’s “Reading at Willow Glen” series (scroll down at the link), hosted by the inimitable Dennis and Christine Richardson and followed by an open mic! If you’re interested in hearing some of my recent as well as older work, please join me there, and bring along a poem of your own to read, one you’ve written or one you admire. I’m looking forward to reading with the home crowd. LASTLY, but not leastly, please SAVE THE DATE, Thursday evening, December 6 for a special December Favorite Poems Reading featuring voices from around the world. Selected readers will share a poem in an original language and in its English translation. Full publicity to follow, but the reading will be held at Stevens Creek Barnes&Noble at 7pm. I have the delightful privilege of posting this to you from my daughter and new son-in-law’s guest room in Brooklyn, New York where all is well and where we enjoyed an equally delightful 60 degree sunny Sunday. The world is a wild and whacky place, frequently wonderful, and I don’t mind if you quote me as saying so. We do not forget those in nearby communities who are still without power, shelter, or home. All the events sound inviting in their own way, but I think the idea of reading a poem in its language of origin, and then in the English translation is SUPERB!